HAVERHILL — Local boxing star Jeff "Hell Raza" Fraza, who appeared on the TV reality show "The Contender," was hit by a train and killed early this morning. Fraza, 34, appeared to be talking on a cellphone when he was hit by a MBTA train on the tracks along Hale Street just before 1:30 a.m., police Deputy Chief Donald Thompson said. Boxing star Jeff Fraza of Haverhill, who competed on the TV reality show "The Contender" was hit and killed by a train near his home early Saturday morning. The collision happened near Fraza's home at 7 Mulberry St.
Police said they are investigating why the Haverhill native was on the tracks at the time. The train was travelling 35 mph, police said. After a successful boxing performance on NBC's "The Contender" Fraza had lost his contract for a series of televised fights. A successful boxer for several years, he recently had been training young boxers in Haverhill. "The Contender" was a reality-based television show which aired in 2005. It focused on the lives of a group of boxers, competing against one another. It was hosted by boxing legend Sugar Ray Leonard and celebrity Sylvester Stallone. He was a regular at the gym. And when Jeff Fraza was not training himself, he was training others, including his 14-year-old son, his cousins, and other youth at the Haverhill Boxing Gym, where he grew up, his friends said yesterday. Fraza, a 34-year-old boxer who had appeared on the hit television show “The Contender,’’ was struck by a train in Haverhill Saturday morning. He was pronounced dead on the tracks, not far from his home, just before 1:30 a.m., MBTA officials said. They said the incident remains under investigation. The train had already dropped off its passengers on its last trip and was returning to Boston when Fraza was hit. Word of the death spread quickly across the state’s close-knit boxing community, and Fraza was remembered yesterday as a dedicated fighter who gave back to others in the same gym where he learned his trade. “He was a huge contributor, helping Haverhill’s inner-city kids,’’ said Sam Amari, a board member of the Haverhill Boxing Club. Fraza’s father, Norman, runs the club, and the two of them would train local amateurs. Amari saw Jeff Fraza training others at the gym just last week. Fraza went by the moniker Jeff “Hell Raza’’ Fraza, and he built up a 17-3 professional record, with 10 knockouts. 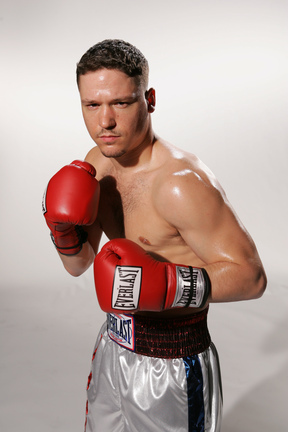 He was best known for his appearances on the reality show “The Contender,’’ in 2005. He was sent home in the first season because he contracted chicken pox, but returned the next season. His loss on the reality show in 2006 was his last fight. Ward said that he trained Fraza for some time and that Fraza had talked of fighting again, “maybe making one last shot at it.’’ In 2007, Ward brought Fraza and his father to Florida, where Fraza served as the chief sparring partner for professional boxer Arturo Gatti. Fraza’s return to the ring was put off when he was diagnosed with Crohn’s disease, an inflammatory bowel disease, but he remained committed to the sport. Most recently it was as a trainer, for his son Antonio, 14; his cousins; and other youth. “He was a huge part of the boxing club; he’s helped hundreds of kids,’’ Amari said. He said that the local boxing community is looking at ways to properly recognize Fraza’s contribution to the youth and to the sport.